Tracked multiple takes of four songs yesterday and they may all be keepers! I also did a little Mastersound top (nice and thin) with the groove hat bottom (a little heavier) which worked really well. Snare wise I’ve used the Ludwig twins (supra and black beauty) and also the Spaun 5.5 x 14 wood hoops with the snares off. 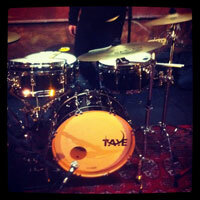 Drums have all been my Taye kit, rack and 14″ tuned up tight and the 16 and 22 tuned low and fat. Can’t wait to get over there today for more tracking, these sessions are off to a great start!